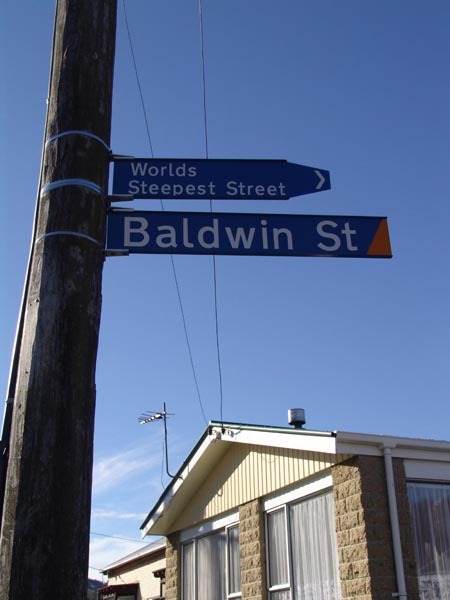 On the 28th, Jos and I woke up in the morning and set out for Baldwin Street, the steepest residential street in the world. It took us around half an hour to get there. 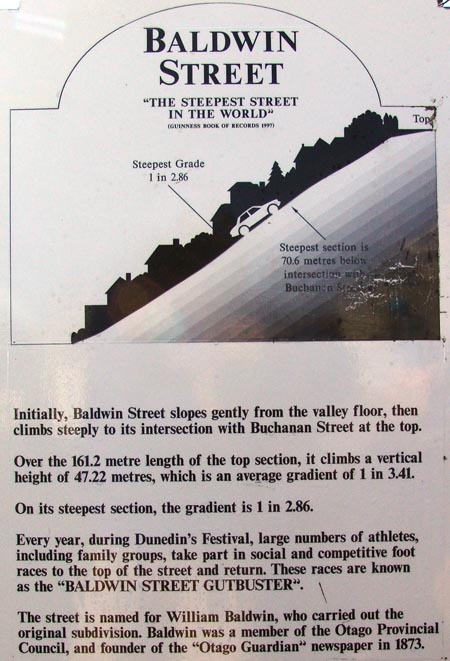 Read this; it allows me to be lazy and not explain Baldwin Street. Walking all the way up the street was tough – I was definitely wheezing by the time we reached the top, and luckily someone had the good sense to install a water fountain beside the bench at the top for people like me who didn’t bring anything to drink. 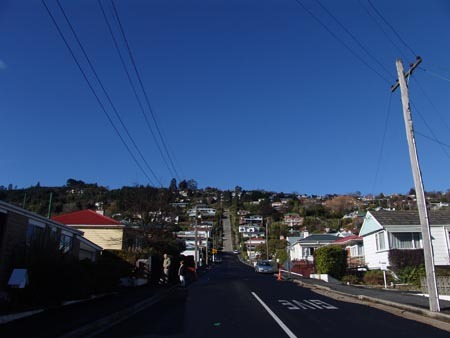 We walked up the road itself – the sidewalk is stairs, that’s how steep this hill is! Can you spot Josephine’s head? 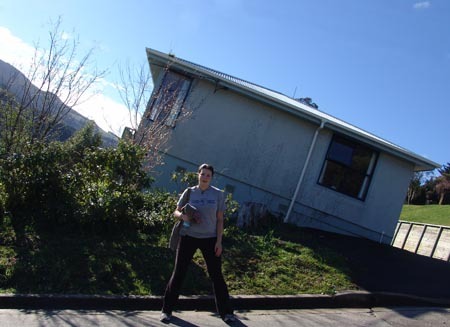 After Baldwin street, we went to Alec Avenue, world famous for the crazy architectural designs of the man who built the houses there in the 1920s. I suppose he wasn’t just an architect, but a bit of an artist really. Well, Jos left Dunedin the next morning on a bus to Christchurch. She spent a couple days there then flew back to Brisbane for her second semester at the University of Queensland. Her blog is at http://josephinestheory.blogspot.com/. The streets of San Francisco definitely do not compare to Baldwin Street. 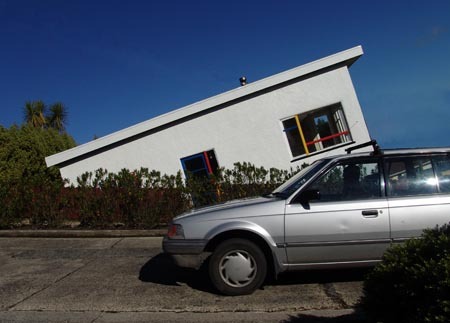 Those houses on Alec Avenue look soo trippy! Hahaaha! I wonder what they’re like inside… Did you guys get to go in? Anyhoo, I’m gonna go see Joey’s blog. Ciao for now Chris! 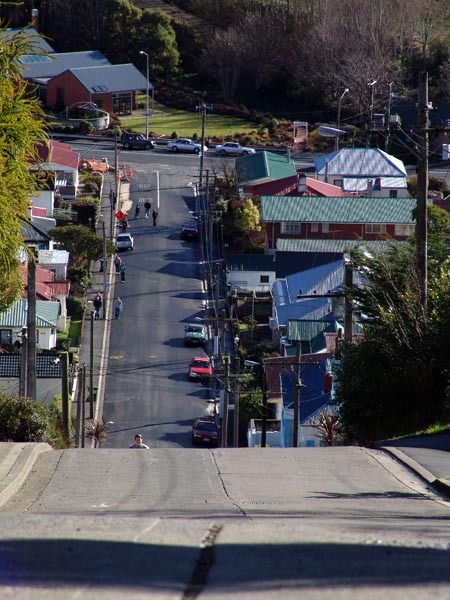 World’s steepest street is pretty cool… I love the picture of the street with Joey’s head peeking out.